Whether you’ve come looking for pristine mountain lakes, abundant rivers, alpine streams, or backcountry fishing, Mammoth Lakes has you covered. Find local fly fishing shops and knowledgeable fishing guides in Mammoth Lakes, California to make the most of your fishing adventure. Brock's Flyfishing Specialists is located in the beautiful Eastern Sierra's and offers flyfishing schools, guides, gear rental and locally tied flies! Locally owned and operated! Fully furnished cabins on Hot Creek. Perfect for anglers with an on-site fly shop. Cabins include all linens, kitchen utensils, and a barbecue. For the ultimate fly fishing experience and adventure - give us a try! Outdoor retailer, rental equipment and guided activities, too. Flyfishing guides and instructors in Mammoth Lakes, California! $380 for a full day including lunch. Sporting goods outlet in Mammoth Lakes, CA. Sells supplies for any outdoor adventures in the eastern Sierras, including skiing, biking, fishing, hiking and snowboarding. Fly fishing guides for trips in the eastern Sierras. Offering trips to various local rivers and lakes, with different options for different levels of experience. Outdoor adventure guide company based in the Eastern Sierras. Offering horseback, camping, hiking and fishing trips throughout the area. Allows users to create their own itineraries! Year round fly fishing and drift boat guide for the Eastern Sierra region. Also sells many fly fishing supplies. Family fun awaits. Professional fishing experts offer knowledgeable service personalized to meet your needs. Largest variety! Guided trips and tours including equipment needs now booking! 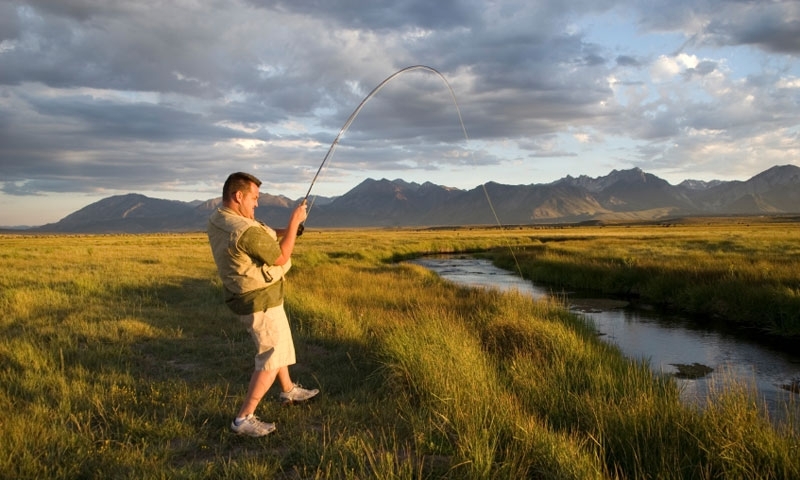 Angler’s come to Mammoth Lakes for its access to abundant lakes, streams, rivers, and backcountry fishing opportunities. When fishing around Mammoth Lakes, trout is the name of the game. Common species include rainbow, brown, brook, eastern brook, golden, alpers, and cutthroat trout. Fishing in Mono County begins the last Saturday in April and ends on November 15th. For those looking for year round fishing, the catch and release fisheries of Upper Owens River, Easter Walker River, and Hot Creek are open year round. All anglers 16 years of age and older must carry a valid fishing license. One-day, two-day, and annual passes are available for purchase online from the Department of Fish and Game, by calling 760.934.2664, or from several shops around Mammoth Lakes. Experience. Know-how. Passion. Three characteristics shared by all the guides on our site. They know the best spots, the right times, and the preferred techniques. Hire one of them to eliminate the guess work and fast track your path to landing the big one. This is classic Sierra Nevada river fishing. Dream of landing a legendary Brown Trout? Owens River is your place. This catch and release fishery is open year round. Come to hone your skills and enjoy the proximity to thermal hot springs. This large mountain lake (one mile long and a half mile wide) boasts populations of cutthroat, rainbow, brown, and brook trout.